Google today rolled out a new feature for Gmail and Calendar users. 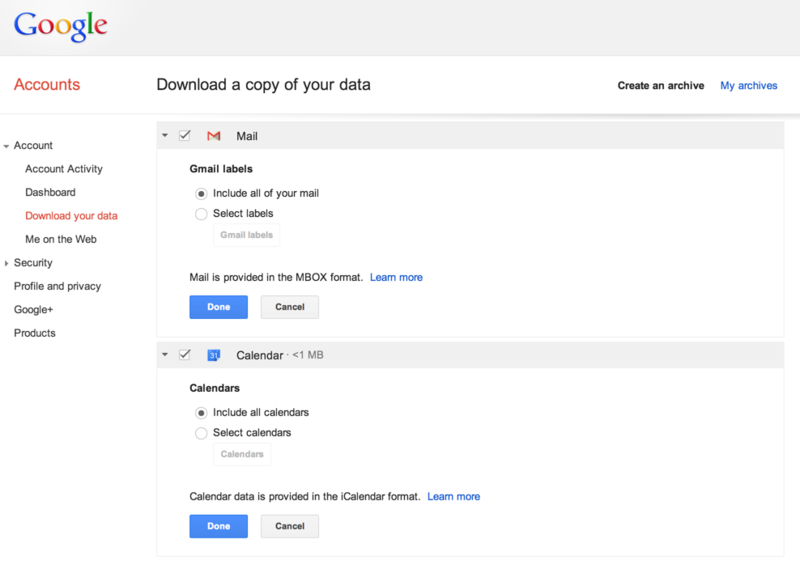 Now Gmail and calendar users can download their Gmail and calendar data from Google takeout program. Here is a step by step instruction how you can download your data from Google takeout program. If you are not aware of Google takeout, then it’s a service which is offered by Google to take out your data from Google service. It’s nothing but keeping a backup of your Google data locally. If you wish to move away from Google, then this backup will help you to move to other service provider. Till today, Google has not offered Gmail and Calendar service in Google takeout program to backup data. But from today onwards users can take backup of Gmail and calendar in Google takeout program. Currently Gmail is not yet live in takeout program, as per the official announcement it will be available in next few months. Maybe you can expect this feature in new year. Once this feature is live you can take Gmail backup in MBOX format. Which is supported by many mail providers to import mails. Once the Gmail backup service is live, you can take Gmail and calendar backup by visiting this link. Google takeout allows you to download complete backup of your Gmail mailbox or you can take only selected labels using takeout programs. When it comes to calendar similar things applies. You can take selected calendars or all your calendars backup. Calendar data is provided in iCalendar (*.ics) format to take backup. If you are not aware of iCalendar format, then it’s one of the most popular format to take calendar entries backup. Most of the popular online calendar service and desktop software supports iCalendar (*.ics) format to import calendar data. options. 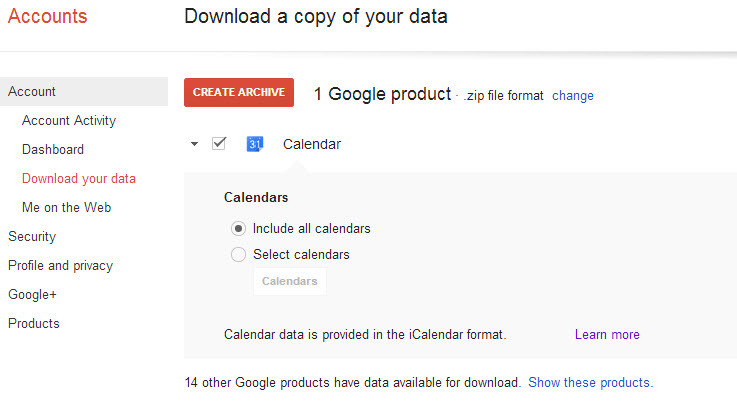 If you choose Include all calendars, then it will include all your Google calendar data in backup. If you don’t want all your calendar, then choose “Select calendars” option to backup only selected calendar. After choosing calendar click “CREATE ARCHIVE” button to download your Google calendar backup to your PC in *.zip file format.